If you are anything like me you want to shop at your local farmer’s market, buy ingredients that speak to you, and go home to make something wonderful. This vision of myself is in conflict with the reality that I often stroll through the market, listen to the Bluegrass band, buy a big bag of kettle corn, and return home empty handed. This weekend I bucked that trend and threw myself head first at the fresh ingredients before me! This time I came home with a wonderful bounty of tomatoes, peppers, garlic, etc. to make fresh salsa. This will be my first post in a series of posts I plan to write outlining my quest for the perfect homemade salsa. 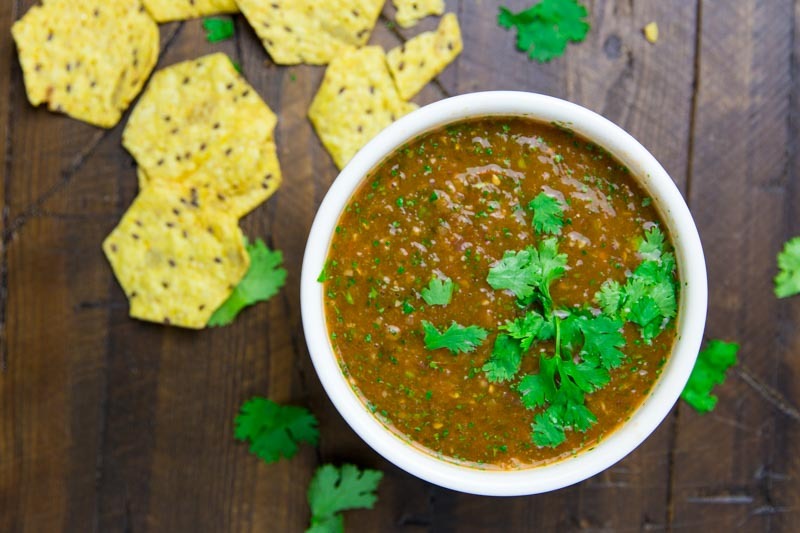 Now sit back, grab an ice cold Modelo, and enjoy this post for Farmers Market Smoked Salsa. I found huge bulbs of garlic, poblano peppers, limes, cilantro, heirloom tomatoes, and red onions at the Lake Anne Farmer’s Market. I smoked the vegetables first before turning them in to salsa. I cleaned the peppers, tomatoes, and onion then rubbed them with EVO. I left the garlic whole as I wanted it to smoke in the bulb. I set the Big Green Egg up for indirect cooking setting the temp at 250° using some hickory wood chunks for the smoke. Once I saw that thin blue smoke it was time to set the vegetables inside. I smoked the vegetables for 2 hours in the setup described above. I took them out and let them cool at room temp. After the vegetables cooled I placed them in a food processor with juice from 2 fresh limes, cilantro, cumin powder, and mixed through. The salsa came out delicious and was served with some warm chips. This salsa was good but here is what I plan to do the next time: Smoke the peppers only as smoking everything gave the salsa too much of that flavor. Char the tomatoes to get that blistered skin and color in to the salsa. Finally I will add (or use) a jalapeño pepper to get a little more heat. Well, thanks for taking this journey to great homemade salsa with me. Until we eat again… have a great day!